Feminism is a family issue, Anne Hathaway says. When Anne Hathaway had her first child in March of last year, she says that every cell in her body changed as she found that she suddenly had the ability to cherish both her career and another person even more. Hathaway’s child was, of course, completely dependent upon her, and Hathaway found herself almost completely dependent upon her husband for help.Yet she realized then that most families don’t have the ability to respond to those new, sudden, and urgent needs when parents have to return to work soon after birth. Hathaway pointed out that fully one-quarter of new mothers go back to work within two weeks of having kids because they cannot afford to take unpaid time off, and many women who can afford to take more time off don’t because they are afraid of being penalized in the workplace. But the issue goes even deeper for Hathaway, the new United Nations Goodwill Ambassador for Paid Parental Leave and a supporter of the UN’s #HeForShe campaign for gender equality. Because in addition to women needing adequate paid time off after birth, Hathaway says men need the same in order to create gender parity in the workplace and at home. In fact, the lack of fair, equal paid parental leave laws around the world are a major barrier to women’s equality, she said. “The deeper into the issue of paid parental leave I go, the deeper I see the connection in the barriers to women’s full achievement and the need to redefine and de-stigmatize men’s roles as caregivers,” she said. 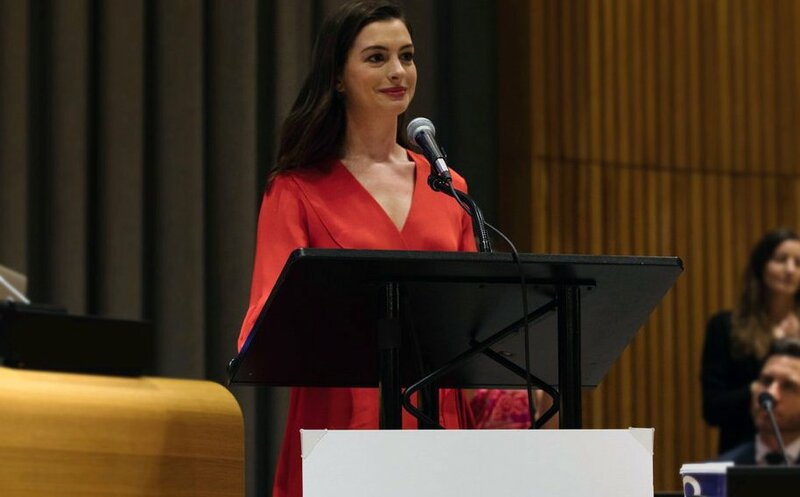 Hathaway’s keynote address to global leaders that had gathered at the UN followed powerful remarks by Deputy Secretary General Amina J. Mohammad, the highest-ranking female official at the UN, and Icelandic Prime Minister Bjarni Benediktsson, a #HeForShe supporter whose country is ranked among the most successful on issues of gender equality in the world. Benediktsson unveiled a “barbershop toolbox” at the assembly that organizers can use to engage men and boys in discussions of gender equality. Benediktsson even packaged the information inside an actual toolbox that he presented to the organizers of the event. Local New York news anchor Sade Baderinwa hosted the event, which also featured “America’s Got Talent” singer Jana Brown and a panel discussion about the future of women in the workplace with female executives from LinkedIn, Google, and Airbnb. The room at the UN was filled with women dressed in red for the observance of IWD and the Day Without a Woman protests. Hathaway, also donning red, announced that the French food company Danone had pledged to give equal parental leave to men and women and to increase the amount of paid leave to 18 weeks by 2020 as part of the #HeForShe campaign. Hathaway said that the “stubborn” notion that women should care for the home and the family was discriminating against women as well as holding back men from full participation in their families and society. “Why do we continue to undervalue fathers and overburden mothers?” she said. “It’s not about taking days off work. It’s about creating the freedom to define roles and how to invest time and to establish new positive cycles for behavior,” she said. The IWD celebration also featured a video of Hathaway interviewing global leaders about activists on how to implement paid parental leave. She spoke with Chirlane McCray, the first lady of New York City and wife of Mayor Bill DeBlasio, who instituted a new policy for city workers offering up to six weeks of fully paid leave for moms and dads as well as parents who adopt or participate in foster care. They can also combine existing vacation with the policy for up to 12 weeks of parental leave. Hathaway then decided to devote her time and efforts to promoting paid parental leave around the world. “The whole world grows when people like you and me take a stand because we know that beyond the idea of men and women, we know there is a truth: that love is love and parents are parents,” Hathaway said to applause. Anne Hathaway, we applaud you and your commitment to #LevelingtheLaw.